With the climate clock ticking faster than ever, there’s a renewed focus on trying to deal with carbon emissions by turning them into fuel. A new hybrid approach aims to utilize sodium and carbon dioxide to produce electricity and hydrogen, which in turn can be used as a clean fuel. As reported in the journal iScience, the researchers have constructed a system that uses carbon dioxide in a water-based solution to produce electricity and hydrogen for over 1,000 hours. The conversion rate is high at 50 percent, which makes this a promising new tech. "Carbon capture, utilization, and sequestration (CCUS) technologies have recently received a great deal of attention for providing a pathway in dealing with global climate change," senior author Professor Guntae Kim, from UNIST, said in a statement. "The key to that technology is the easy conversion of chemically stable CO2 molecules to other materials. Our new system has solved this problem with CO2 dissolution mechanism." To develop the system, the international team of researchers took inspiration from Earth’s oceans. A significant portion of carbon dioxide emissions produced by humans gets absorbed into the oceans and turned into acid. An increase in acidity can be employed as a source of electricity, and the researchers found a way to do just that. The tech is designed like many other fuel cells, with an anode, a cathode, and a separator. The carbon dioxide is injected into a water solution, where it then induces an electrochemical reaction. The reaction eliminates carbon dioxide, turning into sodium bicarbonate, which is also known as baking soda. 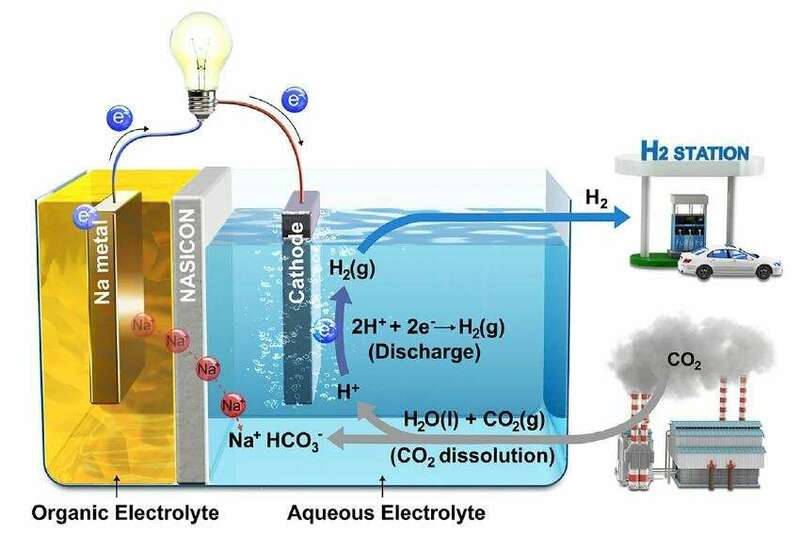 "This hybrid Na-CO2 cell, which adopts efficient CCUS technologies, not only utilizes CO2 as the resource for generating electrical energy but also produces a clean energy source, hydrogen," explained co-first author Jeongwon Kim, a graduate researcher at UNIST. The team is hopeful that this system will continue to improve as well as kickstart new tech based on similar approaches. The researchers think that every part of the apparatus can be made better, capturing even more carbon dioxide.